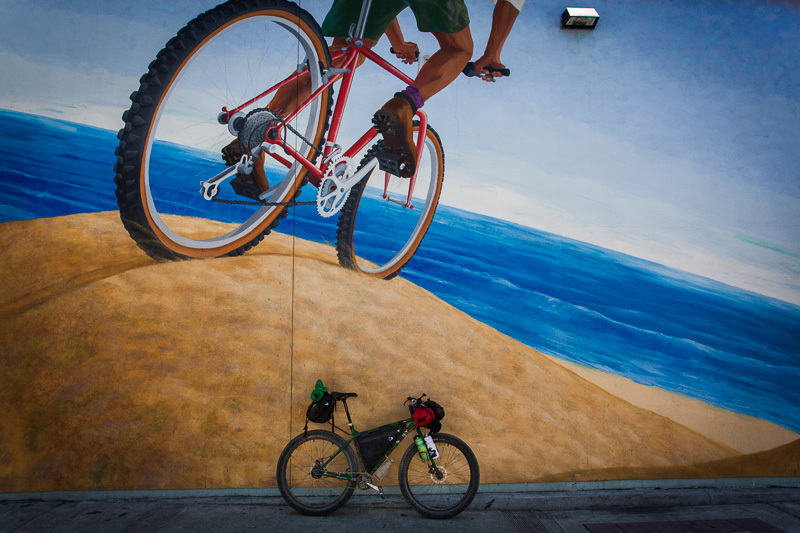 Dirt roading in the Bay Area proved a good testing ground for the Krampus/Rohloff combo. It’s doubtful there’s such thing as the perfect bike – at least if you’re attempting to shoehorn everything into one machine, as I always do. But right now, I have to say my current setup feels completely dialled. It’s as good as it’s ever been, fine tuned for the kind of terrain and travels I enjoy most. Above all, it’s a blast to ride. Still, it’s a perennial habit that I’m always tinkering, refining, experimenting, looking for those elusive last improvements. Perhaps they’re not always improvements – just something different. Anyway, with my trip to Peru/Bolivia/Argentina in mind, I’ve jotted down some random gear thoughts while they’re fresh in my mind. Inevitably, these ponderings won’t suit everyone, and take into account my riding style (dirt, dirt and more dirt) and my destination – namely that it will be cool and mountainous, and at the time of year I’m visiting, predominantly dry. Choices might well be different it was, say, predominantly paved, or jungly, humid and bug-infested. After reverting to derailleurs for much of last year, I’m delighted to be reunited with my Rohloff 14 speed internal hub (thanks GBT for the build!). Despite its few foibles, the Rohloff is ideal for laden, dirt road touring. As omnipresent as derailleurs are, I won’t be leaving home without it again, and definitely recommend one if funds permit. Mine has gone from bike to bike over the last seven years, and has clocked up untold miles in the process. 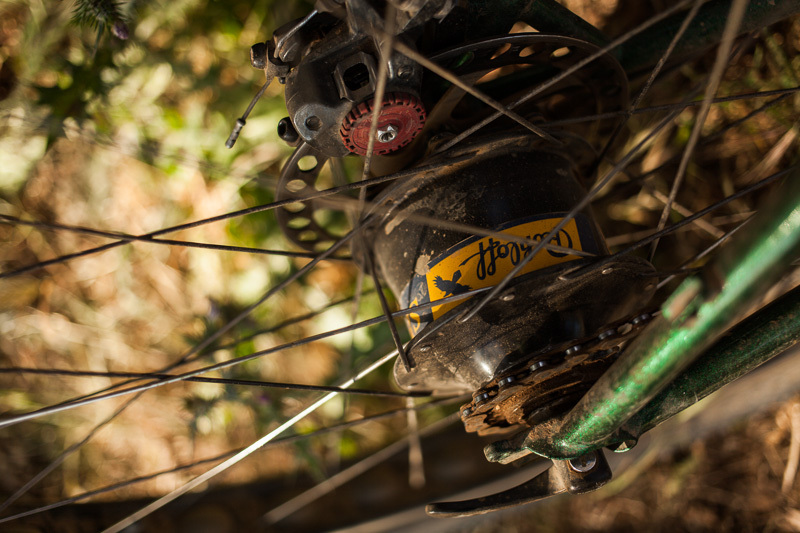 Rohloff Speedhub: ready to do battle with mud, dust and grime. 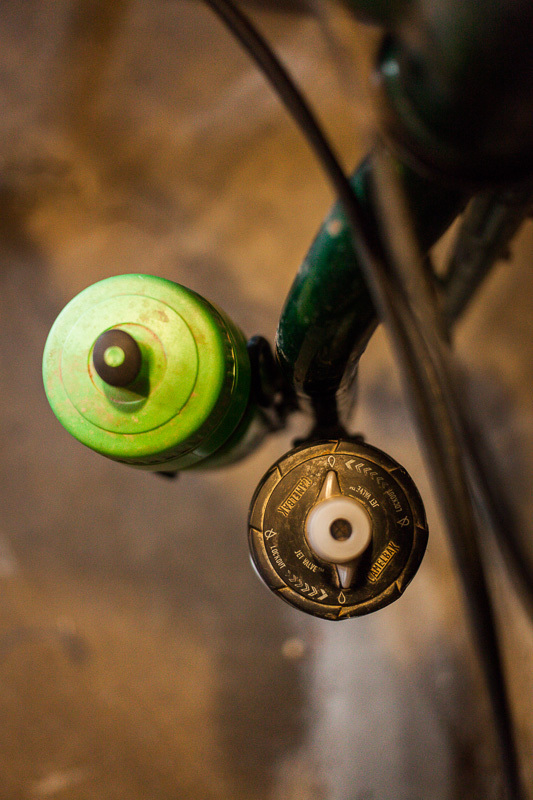 The Monkey Bone, from Cycle Monkey, is a neater solution to Rohloff’s Speedbone. Used with non Rohloff-specific frames, it anchors the hub to the disc brake adaptor. As for tyres – always a topic of debate amongst cyclists – its 3in Knards have impressed too, offering such a plush ride that my body is rarely sore at the end of the day, no matter how harsh the terrain. Without doubt, they make a worthy replacement to suspension for more challenging off road touring. Although the extra weight is undeniable, their heft hasn’t proved to be an issue, more than mitigated by near-limitless grip – both up and down the trail. Still, given their price ($90 for the non-folders) and relatively soft compound, I’m not sure that they’re the sweet spot for my own touring needs – I’m thinking a longer lasting 2.4 would suit me better, adding to valuable mud clearance too. But – there’s no denying that when it comes to babyheads, corrugation and sandy patches, Knards are in their element. Whittling down gear for long distance, pannier-free travel is always a challenge. Still, I’m in no rush back to revert back to racks or a trailer just yet. A combination of a handlebar rollbag, framebag (both from Porcelain Rocket) and a roomy, easy to access saddlebag (Carradice Super C) offers space for gear, food, DLSR and my Macbook Air – without resorting to a backpack. I like the concept of the Bagman2 (with Expedition Support), but I need a tougher version for rock-strewn backcountry riding. I’ve needed to repair the support plate – hopefully the fix will hold out. Otherwise, I might try a small rear platform rack to support the saddlebag. Finally, I’m about ready to bid adios to my SPD pedals for the next trip. That’s not to say I’m a die-hard convert to flat pedals for all applications, but the current combination of chunky, pin-laced pedals (Performance Bikes Shovels) and Keen hiking shoes is working really well, and rarely leaves me wanting. I’m tempted by a pair of Shimano Saints – of which I’ve heard good things – as my current pedals are on loan. My full gear list is posted here. These thoughts are related to that list. Baggy shorts and merino underwear (Rapha, in my case) work great. No padding required. I don’t miss trousers; I’m fine with shorts, thermals and wool leggings when it gets chilly. As for social occasions, I’ll get by – I don’t mind looking a bit odd. More trivially, my favourite Indian bobble hat was fatefully shrunk in the wash. I love my hat, so this is a (minor) travesty. I’m on the lookout for a worthy replacement. I’ve been borrowing a 6 Moon Designs Gatewood Cape, a minimal tarp that doubles up as a waterproof cape. Although the cape transformation hasn’t proved relevant to cycling (I always carry a waterproof shell), it’s an excellent tarp in its own right. I’d buy one of my own, but I’m thinking of investing in its big brother, the Wild Oasis – which, for just an extra 57g, includes a mosquito skirt, and it’s roomier too. The Gatewood Cape packs away into its own pocket, easily tucked into my handlebar roll bag next to sleeping bag and layers. I barely know its there. 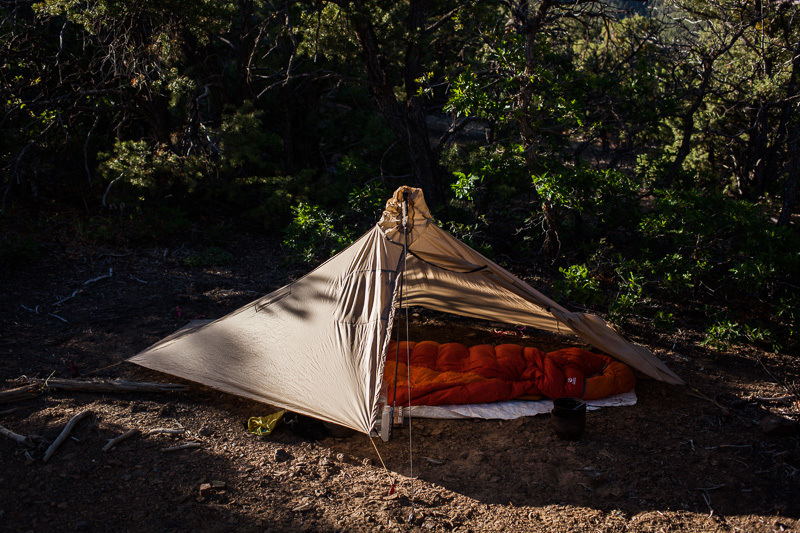 Inevitably, a single skin tarp isn’t without its compromises – but for where I’m heading, I think I can live with them. 6 Moon Designs’ Gatewood Cape. A paltry 312g in weight, and not much bulkier than an inflatable sleep mat. My sleeping bag is in need of replacement for the big trip; this will be my chance to try out a quilt, most likely from Jacks ‘R Better. I’ve heard good things about them. I’m not unaware of the irony of paring back clothing and camping gear to the minimum, only to haul more than their equivalent weight in camera gear. But… I like taking photos. I’m constantly debating the merits of a lightweight mirrorless camera system versus a higher quality, full sensor DSLR. A DSLR may be brick-like, but I’ve come to really enjoy my Canon 5dMk2 with a simple 40mm f/2.8 pancake lens as a general use camera. It’s quick, robust, and relatively speaking, not too obese. Plus, I really like the 40mm angle of view – it’s the same I had on my Lumix GF1. I’ve so enjoyed this single lens setup that if I could drum up some cash, I’d think seriously about investing in a Fuji X100s (with its fixed 35mm lens) and taking just that. (Similarly, if budget wasn’t tight, other contenders would include an Olympus OM-D, a M4/3 camera that comes highly recommended by cycle tourists). All three of these cameras allow you to separate the focus from the shutter release, which, for one reason or another, is my preferred way of taking pictures. In any case, if you already own a Canon Brick Mk2, check out the 40mm pancake – it’s a relative bargain at $150-200. I’m now joined by an umbilical chord to my iPhone 5 (web browing/reading/music/topo maps/GPS/photos). A downside is it’s insatiable appetite for juice. The Goal Zero solar panel I’ve been borrowing has worked really well. Affixed to my front pouch, it will charge up my iPhone in less then a day, given several hours of New Mexican/Californian sunshine. But… I’m ready for a dynamo, most likely a Schmidt Son, rigged up to a Tout Terrain Plug 2, or similar. 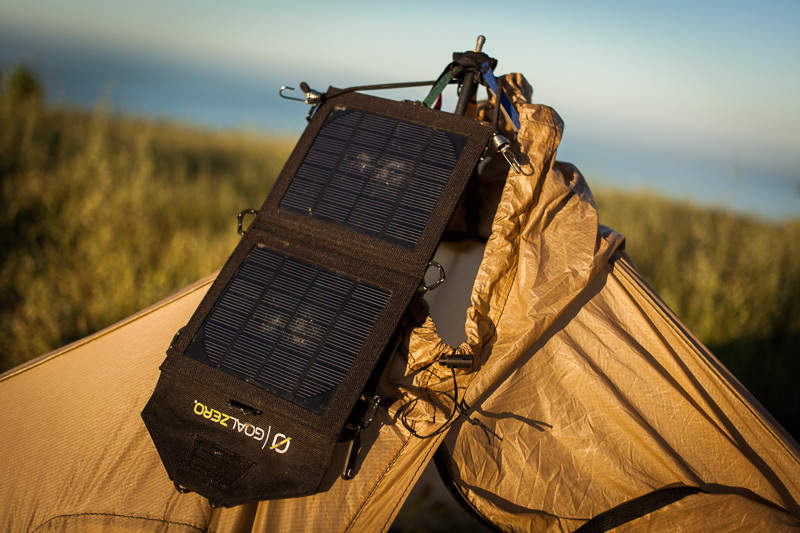 Goal Zero solar panel – does a good job at keeping your electronic gadgets juiced up. Talking of iPhones, I’ve been experimenting with using mine as a replacement for my Garmin Etrex 20. 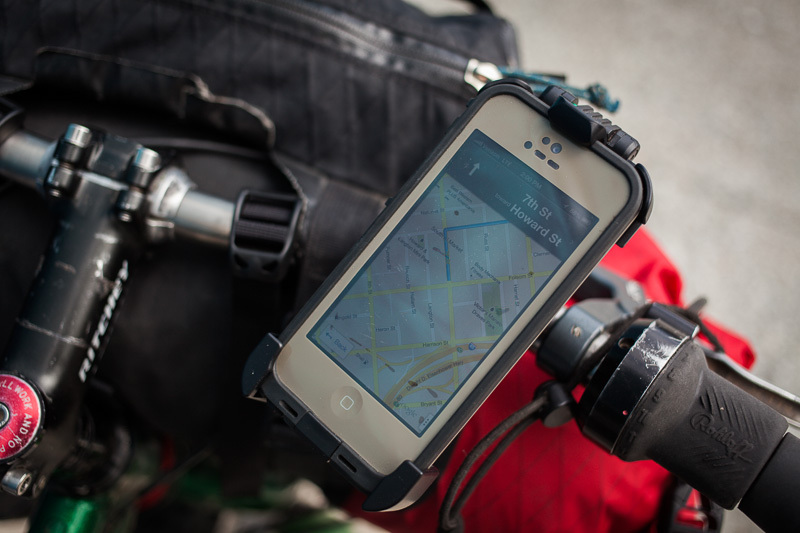 At $80, Lifeproof cases are hardly cheap, but they’re completely dust and waterproof, and the bike mount works really nicely for onboard navigation. Review soon. Lifeproof iPhone case and handle bar mount. Handy for both unfamiliar city riding, and following GPX routes. Observing how the Rabbit Holes fare (they’re single wall rims) over time, and how such wide rims handle 2.25in inch tyres, like a Schwalbe Big Apple, Schwalbe Smart Sam or WTB Weirwolf. Smart Sams would be seem to be bargain at $30, but unfortunately they’re not folders, which I prefer. Weirwolfs are light, have a great tread and ride really nicely, but may not last as long. Chunky Maxxis 2.4in Ardents are also a contender. We’ll see. Looking into the viability of going tubeless, at least for an initial portion of the trip. Beyond the South West (mined as it is with goatheads), punctures are rarely a real issue on tour. But perhaps more importantly, tubeless tyres feel great at low pressure, offering a very effective alternative to suspension over even the roughest terrain, while eliminating dastardly pinch flats. If you have thoughts or experience on any of this gear, I’d welcome any comments! Ah – interesting! Can you assign it to a button that’s easy to get to? You can assign it to the function button on the back, just above the thumb rest, or either of the buttons next to the shutter. Cool. The one at the back would make more sense to me, so you can press it with your thumb, and keep the index free for the shutter. That’s how I have the 5dMk2 set up. Funny, because when I sent into a specialist shop in the UK to ask, they assured me it couldn’t. Good to know. after lugging various dslr’s around, i bought an x100 last year and it’s my go-to camera. you can find a nice used x100 for about half the price of the new x100s…. my favorite camera i’ve ever owned, and one i plan on using until it’s final breath. ps- i enjoy your blog and you are truly an inspiration. I heard the autofocus is the big improvement on the new version, but I’ve also heard pretty much everyone who has the X100 loves it despite any quirks. Realistically, I’m going to make my DSLR work for a while longer. It does sound like an amazing, creative camera though. Cool, low key styling too. Thanks for the comment. You’ll get far more versatility with an OMD and in fact it is one of the most programmable cameras out there, set it up how you like. By the way everyone has been hitting on the Nikon V1 because it doesn’t have the biggest sensor but since it’s a bargain price now with a couple of zooms I picked one up.And….It is amazing. Pictures right out of the camera with no post tweaking are right on the money and it is the ONLY digital camera I’ve ever used that has easy to set menus. Not as versatile as OMD or 5D but the results are fantastic.And perfect for bikey people.I like using it better than my OMD! Never thought I’d say that! It’s a steal at current prices if you can find one. You can also separate focus from shutter. And it’s built tough. As you say, everyone bashed the V1 when it came out (having not tried it) but anyone I’ve met/read about who actually owns one, really loves it. As you say, super quick, and nice jpgs. London Camera Exchange were pretty adamant the OMD couldn’t separate the shutter from the focus – so it’s good to hear it can. All this is theoretical, as I’m not in the market for a new camera anytime soon – but have you seen the pictures from the Fujis recently? There’s something about the colours I really like, not that that can’t be replicated to some degree in Lightroom. Yes, Fuji have great colour quality. It has always been a strength of that brand,however I’ve owned one or two Fuji cameras in the past which were good out of the box but the electronics weren’t reliable after long term use. I don’t trust them now even though the specs look great on paper. And the colour from the Olympus and Nikon v series is also very, very good even by my high standards so its a non issue. In fairness most of the current crop of digital cameras are really capable so it’s just a case of picking the flavor you like. For bike trips, ease of use, handling and reliability are way up there on my list of priorities. I’ve discovered the D-SLR size battery on the V1 camera lasts MUCH longer than the tiny ones you normally get and that has proved to be a big plus! Just completed a two day trip on one battery charge whereas my OM=D for example. will easily eat through two batteries in one days shooting! That’s good to know. The near limitless battery life is something I’ve always liked about my DSLR. I just saw that the brand new EP5 has a 1/8000 max shutter speed, and a minimum ISO of 100 – like a DSLR. That’s always been another missing ingredient of mirrorless cameras for me. I always found fast lenses easily underexposed in bright conditions without the hassle of fitting an ND filter, given the 1/4000 shutter speed and 200 ISO limit. Stopping down seems to squander the whole idea of a fast lens. That’s a really cool new feature. Great post and great taste in gadgets. I am running the Plug II with an SP-8 dynamo and it’s great. The SP-8 is basically the same as the SON as far as I can tell. Regarding cameras, we have been using the Sony NEX-5R mirrorless for a few months now and we’re pretty pleased. I’ve never owned a real DSLR, but my brother is a photographer and seemed pretty impressed by the NEX-5R. Nice and compact for touring. One of the SP 8 series (don’t know which model) is basically the pre-version of Supernova’s Infinity S (which has better seals and a slightly changed exterior but way more expensive) but all lack the pressure equalization system and stainless steel axle tips in comparison to the SON. However it’s the most expensive of all three. With a compact camera you’ll never get the same results and handling as with a DSLR. Though i’m quite satisfied with my X10 (despite it’s nearly unusable OVF). If I would buy a new camera right now, I’d definitely go with the X-E1. The X-E1 looks great too, but something about the X100s appeals about its simplicity – though the difference in size isn’t massive. It has a built in ND filter, which I think is really handy in a mirrorless camera, and has the new X Trans 2 sensor, as well as the optical/digital viewfinder option. When the new sensor and processor makes it into the X-E1 follow up, I expect that will be a killer camera. I had a chance to play with an OM-D, X Pro 1 and X20 while I was in California, and they definitely all have their pros and cons. I think much if it just boils down to what system feels most intuitive and creative to you – and then just getting out and actually taking photos! I meant PD-8 by Shutter Precision (SP), not SP-8… doh! How did you attach the bottle cages to the fork? I used rivnuts. I wouldn’t necessarily recommend it for all kinds of forks, but the Krampus one seems pretty stout. Hi Cass, Great article. I am thinking about using rivnuts to mount Anything cages. Would you think the Troll fork is stout enough for this application? Don’t quote me on this, but I would have thought so. (disclaimer: drilling holes in a bike frame is never an ideal thing to do!) After all, the new Troll framesets come with Anything mounts on the fork. Arguably, I guess brazing in eyelets is the better long term solution, but rivnets are quick and easy, and don’t ruin the paint. I’d experiment with hose clamps first, as much as anything to get the height and angle you’re happy with. Although not as quick to install and remove (the main reason I like dedicated eyelets), they’re a good solution in themselves. Worth mentioning too – I haven’t found the Anything Cages burly enough for long distance, dirt road travel, at least when mounted to the fork blades. I believe some new, improved ones out are fairly imminently. I had a feeling that Nicholas and his magic rivnut tool might have come into contact with your Krampus. I still feel as though any bike is improved with the addition of bottle mounts on the fork blades. Looking back at my fleet of bikes from the past few decades, there is a slow but steady time-associated progression of number of frame-located bottle mounts. Hopefully this will also be the case with fork-located bottle mounts. Hey Andy! As it happens, we may well have been rivnutting at exactly the same time, but at other sides of the country. As per Joe, I riddled my fork with eyelets (an ‘Anything Cage’ to either side, plus a second set of water bottles) – and it works a treat. I think it’s worth trying out P clips first though as 1/ they work really well, and don’t void your warranty and 2/ it’s useful to play around with positioning before you bite the bullet. Great to hear you are gearing up for another trip. I’m just 6 weeks away from flying out to Alaska to start in Prudhoe. Hopefully our paths will cross at some point on our respective trips. The Krampus/Rohloff combination looks sweet! I’ve just built up an Ogre with Rohloff, whilst I’ve gone for a standard front wheel at the moment I’ve already been playing around with the idea of a SP Dynamo which would allow me to run a Exposure Revo & Plug 2. Luggage wise I’ve gone for frame bags and am using my trusty Carradice Long Flap Camper, it will be interesting to see how the Bagman 2 and Expedition Support live up to the job. On the computing front I’m using a Google Nexus for the trip, whilst the image processing workflow is a little clunky, apps like Snapseed give you a lot of creative flexibility without the need for hauling the MB Air to run Lightroom. Things are a bit hectic at the moment, but I hope to write something up on this in the next few weeks. Thanks Mike. I think the Ogre/Rohloff will be the ‘perfect’ bike. What kind of rims did you go for? I prefer the capaciousness of the Longflap Campers, but the plastic buckles on the Super C are handy. I’ve been thinking long and hard about a tablet (with an added keyboard, as I do a lot of writing). Be interesting to hear how you get along with it. As you know, I don’t know anything about charging electronics via a dyno-hub, but have you seen this new ‘made in the US’ dyno/USB charger? It might be worth checking into. You were very persuasive with the recommendation on the Ogre, once I’d seen one in the flesh I was easily convinced. Rim wise I’ve gone for Mavic TN719 not the burliest of rims but seem a reasonable balance of price/weight. The guys at Rohloff don’t generally endorse Mavic rims but some of the reasons are offset when using slightly larger rims i.e 29ers. Yep I’m looking to add a keyboard to my Nexus set up, be interesting to see the weight comparisons against the Air. The other thing I like is the relatively low value of the tablets it doesn’t quite make them disposable but less of an investment should it go pop or take a walk. Once I get some time I’ll pen my thoughts, and ping you a link in the coming weeks. Have you tried Icebreaker clothing? I’m relatively new to cycling, but I’ve been using Icebreaker since my A.T. thru-hike last year and every piece I own still looks brand new. And I wear the hell out of my clothes as I prefer fewer, but finer pieces. Thanks for your comment. I have tried some Icebreaker stuff in the past, but I’m not sure it lasted too well either. Maybe I need to try a heavier gauge weave. I used a powermonkey solar panel for a while and it was useless on half cloudy days. The hub dynamo starts loading my battery at around 15 km per hour. The battery I use is rather simular to the one you use with the goal zero. I get a full iPhone charge from riding my bike through mountainous/hilly terrain for 100 km. If you ride gravelroads for a day you’re sure to have a full charge. On the icebreaker merino; I use that stuff a lot and it is great for biking in and packs down small but I’m not to happy about their lifespan compared to the pricetag. Thanks Rene – what kind of buffer battery do you use? Thanks for finding Bright-Bike! Do you mind if I ask where you heard about us? If you’re looking at the Plug, I can just say that it and the Revolution approach the mounting issue in two different ways. If you want an integrated (but inflexible) solution, then the Plug is hard to beat. 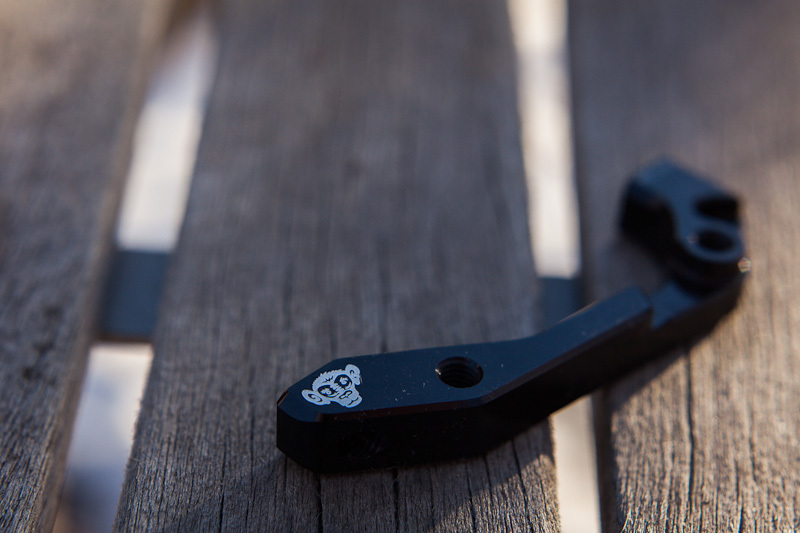 You can mount the Revolution anywhere you want (including on your stem), or just throw it in a handlebar bag. I can promise you, though, that electrically the Revolution is the better product. It’s more efficient, works better with more devices, and its overload protection is much better (I believe the Plug simply turns off if you go too fast. The Revolution will continue working at any speed). Thanks Dave. From the looks of it, the Revolution is compatible with an iPhone without a buffer battery? Yes, it is. We’ve had excellent results with the iPhone 4, 4S, and 5. The older models are more fickle in general, but we do still work with them. With the iPhone 4 and on you should have no problems. Just yesterday I heard from a user who is in the middle of a tour with an iPhone 4S, and the Revolution has been working perfectly with his phone. Thanks. I have an iPhone 5, so sounds like it would work great – and I could use it to charge a buffer battery too, if I needed a backup when hiking off the bike. I’ll do some more research and get in touch. Sounds good. I look forward to hearing from you! Great to hear you will be on the move again. A quick word on dynamo’s and trying to charge Iphones on the fly. An iphone will not charge from a plug II because it needs a constant current as do most battery packs. There needs to be some sort of buffer battery or it will shut down when you slow down/stop. The plug II+ has a lot of issues with the PAT cable ( mine lasted days ) which Tout Terrain are aware of. Without the PAT cable you need to be going very fast for offroad to charge. There are a few units in the market with built in buffer battery’s but do your homework as some just don’t work and some have destroyed very expensive gear. I have a large pile of stuff that did not work. Charging from a bike dynamo is new technology and until it matures I won’t be plugging in my iphone. After spending a lot of time and money what I have found to work well is the E-Werk and Guide 10 Plus Battery Pack . I charge the battery’s during the day and then charge my iphone overnight or use the battery’s in my etrex and headtorch. By cutting the Battery pack cable in half and soldering to one of the E-Werks spare cables the solar input can be used with the E-Werks dialed up to 7V 1.5A for faster charge times. I have found that the charging indicator is on even when pushing uphill. The battery pack can be charged from a solar panel, dynamo or USB. Output is USB or the 4 AA battery’s. If you get desperate you can always buy 4AA’s to charge your phone. This is not what you are really looking for but a battery pack is cheaper to replace should it all go wrong. Cheers for that Simon. Sounds like I need to do some more research. For some reason, I thought the Plug 2 didn’t require a buffer battery, but I know iPhone are notoriously fussy about how they take their charge. With the solar panel, for instance, I have to charge it from the buffer battery. Do you have a photo of your setup by any chance? Also – shouldn’t this work ok with the Plug2, or similar? How we get durability out of our Merino tops is by using a bi-component material which has merino next to skin for the merino benefits and a hard wearing polyester material on the outside. This also creates a top that is faster drying than 100% wool, with all the benefits of having the merino next to the skin. I got one, just at the end of the winter, so it hasn’t had a great deal of use. Most battery packs require a constant 1.0 A to charge. The Plug speed/watt graph (which I have found to be accurate for a 26” wheel) indicates that you would need to be going about 35kmh to achieve this ( more with a bigger wheel ) . But the Goal Zero Switch 8 is designed for a solar panel and according to the pdf user manual has an input of 0-1A so should work fine. I have found charging from a Lithium-ion battery pack to be about 60-75% efficient. The Goal Zero Switch 8 is 2200mAh. An iphone 5 battery is 1440 mAh. You may get one complete charge. I get one charge from my Guide 10 if I switch the phone off. I’m following your electrics thread with interest. I have a Son 28 hub which has been powering a Schmidt Edelux front light this winter. Combination is great. Cars get out of my way! I’ve also purchased a Plug II last November to run with the Son but have yet to install it as I’ve only been out and about near my home in Cornwall and can charge things from the mains. I don’t own a smart phone, GPS or even a straight up mobile but am thinking along the iPhone 5 lines for future tours. The Goal Zero Switch 8 looks like the ideal solution for compatibility issues with the Hub II. I’ll be interested to hear how you get on with this set up Cass, if indeed you go down the Son/Hub II/Switch 8 road. Re. merino tops, Icebreaker have been working fine for me for the last few years. Just don’t get the 150 weight – despite being somewhat comfortably silky and slinky, it’s just too flimsy: gets holes easily, wears thin and through, rips and tears, and I think UV doesn’t help either. All my 150 tops have been patched and look raggedy after a few months/year or two – rips on shoulders from hedges, rips around cuffs, rips under armpits, great if you like looking like a rag and bone man but not good if that’s your go-to top for all occasions! I’ve had NO issues with any of my 200 tops tho’. In particular, (and this defies logic somewhat), the earthen colour seems warmer and more robust. (Maybe something in the dye reacting with the fibres?) A subtle thing but noticeable. 250 weight and above is probably not useful unless you’re in colder climes. I reckon you’ll wear out your boxers quick tho’ Cass! Being subject to all that movement and saddle fiction, but see how you get on. Thanks for the info Justin. I’ll be sure to do a blog post when I eventually settle on a system. Thanks. I’ll definitely check them out. I heard Maxxis had some big 29er tyres in the pipeline. Can’t track down any weights so far, but to be honest, I’d go for burly sidewalls at the expense of gram shaving, especially for running tubeless. The marketing spiel promises ‘low rolling resistance’, so be interesting to try them out. Both superb quality. See a Katabatic Gear review on my site. I also just wrote on lightweight shirts last week =) I have a 150 g/m icebreaker which has held up very well, and can also recommend the Rab MeCo and Patagonia Capilene shirts, all topnotch. As for energy, any solar panels I’ve tried yet need to successfully work. They’ve been all rather disappointing, so I hope you will have better success with your system. I will keep an eye on it, that’s for sure! Thanks for the recommendations Hendrik, I will check them out. The Katabatic Quilt, with a rating of -10c and a complete weight of 700ish grams sounds ideal. I’m looking for something between a -5 and -10c rating. Joe recommended the Jacks R Better quilt, which is why I was headed in that direction. Given the relatively high altitude and relentless sunshine here in New Mexico (similar to the Andean altiplano, I expect), the Goal Zero combo has been really good. Attached to the front of the bike (so in and out of shadow depending) I can easily charge up the buffer battery during the day – which provides a full iPhone charge in the evening. Additionally, I leave it out in the morning while having breakfast/pulling down camp, then make sure my bike is always facing the sun when I stop for breaks. The attachment points are nice, and the whole system has proved pretty robust so far. I like how a solar panel crosses over for hiking (I imagine I’ll do some multi day hikes en route) but expect the dynamo system to be the ideal bike touring solution. It has no hood and you can zip the foot end completely which makes it a blanket. I was able to test it for 3 nights around 10 °C with a silk liner and it was quite comfy. FYI: Merino socks wear out v. quickly – don’t go there unless you use a thin pair as a warm under-layer! Hemp is an excellent choice for sock material, much more durable than cotton, gets wet like cotton, yes, but dries quicker. I’d be surprised if your Rapha boxers last five minutes, but I’ll keep an open mind…. Query: if you were going to fix bottle cages on LHT forks bike-packing styley, using the single front-rack lugs on either side, do you think I could get away with just a fattish cable-tie to secure the base of the cages, (bearing in mind there’s already one securing bolt), or would you recommend a hose clamp? I’m reluctant to use hose clamps because they’ll eat into the paint and expose bare steel. (In Cornish salty sea air, bare steel rusts FAST!). But I guess a bit of inner tube rubber shim between could act as a buffer. Cable ties will probably perish longer term with UV tho’ as with all plastics, but I’ll have changed the set-up b4 that happens. Advice welcome. Thnx 4 heads up on visas. How do you get on with your Trail Gloves? I’ve been through Vibram-soled sandals, FiveFingers (stinky w/o socks and socks a pain to get on), Inov-8’s (toe box too tight and upper fabric prone to ripping), and am now on Vivo Barefoot Breatho Trails and New Balance MT10 v2’s. Breatho Trails comfy but rubber soles too soft to be durable on any serious rock. MT10’s in post, yet to be tested – look interesting tho’. Sleeping bags – check out the Mountain Equipment Xero bags. I have a 550 as I’m skinny and like being toasty. Lightweight, very compressible. Mine packs into an Exped dry bag, squash the air out and you get A4 size x 1″ approx. 350 would probably suit you, but maybe you don’t like mummy style bags hence quilt interest? Thumbs up for the Merryll body gloves: more versatile than the 5 Fingers (which I love), and so far, holding up relatively well. (Though sharp rocks and thin soles are never going to be a match made in heaven). Similarly, I’m liking the Raphas so far. They come recommended by a friend who does at least as much riding as I do. For your LHT, I’d suggest applying a couple of rounds of gorilla tape under P-clips for a secure fit that won’t leave a mark. You may have finally pushed me over the edge on the Rohloff!! Regarding cameras itnis a constant challenge. I keep struggling as I get more and more used to an FX sensor and the depth it gives the camera. So much so that I just sold my lovely fuji XE1 and lenses yo give the Sony RX1 a spin as my only on bike and travel camera. So far it has blown me away. Just need a few extra batteries and a 2-4 stop ND filter and it is a small and wildly capable kit! An x100 would fit the bill as well but it is hard to imagine a nicer sensor lens combo than the RX1. Thank you for the inspiration and your incredible journeys, words and images. I’m fascinated to hear you’ve invested in the Sony! What a treat! As you say, there’s a depth to a full frame sensor – a particular feel that doesn’t just boil down to image quality. I look forward to reading your thoughts on it at some point. In fact, your enthusiasm for the EX-1and the images on your post was one reason I was looking into the Fujis. Ever used a TwoFish Quick Cage adapter? Or Elite VIP cable tie bottle clamps? I have used Elite VIP cable tie bottle clamps with 1 liter bottles and they worked well on road. Haven’t tried them off road. I find anything that clamps to bars or frame benefits from self amalgamating tape. It is a super grippy nonsticky tape that welds to itself. Once wrapped around frame/bars will never move and neither will anything clamped to it and no sticky mess. Yes, I run my seat post pretty long, as I’m between an L and XL frame. Are you planning to use a support of some kind? With the Bagman Expedition, I think you’d be fine running it an inch or two lower. It’s a great support for general use. For rougher terrain, I’d recommend a rackless design – like a Porcelain Rocket or Revelate seat pack – or mounting a conventional rear rack for support, if the height is right. You might get a little Nitto or VO to work too. I believe there’s a burlier version of the Bagman in development – that could be ideal. Curious to see your review on the Rabbit Holes. They certainly are an interesting/great combo with the knards. I got my Krampus last week and absolutely love the way it rides on both rolly and technical terrain. It even feels at home in the air. I am a little worried about the rear Rabbit Hole though. There is very little room between the tire and the chain stays. So far the wheel has not stayed in true very well, and it won’t take much to develop rub. Granted, this is a stock wheel, and I have been riding it pretty hard. I could always pull it back in the drop outs, but I don’t want to give up chain stay length. I’m thinking about lacing it up to a different hub/spokes, and see if that helps. How have your’s been holding up? Hi Brian, now that I’ve got some time and miles under my belt, I can report that the Rabbit Holes are holding up surprisingly well. I agree, the clearances are a little tight, but definitely no tyre rub issues from a wobbly wheel. I’ve been riding the bike loaded with bikepacking gear, and hammering it around my local rocky trails – so all told, I’m happy so far. Perhaps it’s worth getting the wheels checked over by your local wheel builder? If you’re thinking of a rebuild, I’d go for sealed cartridge hubs over the cup and cone Shimano ones – mine always seem to loosen off. You read my mind with the sealed hub option. I’ve been considering a Hope as the price isn’t exorbitant, and it comes in gold. The only problem is that it is still spendy, and costs about the same as a dropper post and carbon fork…both on the wish list. Hi Cass, I find having wet feet for days on fairly grim (particular thinking about Central America in raining season). Do you just accept it or do you have some tips for that? How did you deal with that in Central America? Just accept it? My 2 cents worth on kit: I use a Samsung	Galaxy Note which is basically a smartphone with a massive screen. So I can update blog as well as GPS, camera, email, Apps. Aside from the massive screen you can buy spare batteries (which is not the case with the iPhone, I believe?) I have 3 (and they’re not big) so I just make sure they’re charged up ever time I stop. I’ve never had a problem running out but I guess I don’t overuse it for GPS (occasional use). A potential idea for eliminating the need for dynamos /solar chargers for a phone? I have a small charging device too so I can leave it charging without worrying about my phone or charge both simultaneously. Anyway works for me, may not be for everyone. Thanks for that Nick. I’ve got an iphone 5 now, so I’ll stick with that – but the Note looks like a great cross between a tablet and a phone. The size could be an issue when you’re at home (bit big the pocket) but not when touring, as far as I can see, as I never use the phone as a phone, as it were. Non Mac stuff is so much more practical – spare batteries and expandable memory, for instance. Hi Cass, We’re just building up a Speedhub Krampus – what size ring you using up front to clear the chainstays? Guessing you stuck with the 38 as on the Ogre? Cheers for any help, Rich. Yes, I went with a 38T (a Thorn reversible chainring), as that’s what I had to hand – transferred from my Troll, in fact. I’m finding 38×17 works fine for big tyres and lightweight touring, but I’d happily run a 36T if I had one. Cass, just checking back in on the camera gear. I am waffling a bit between the RX1 and the Fuji system. While there is something very, very special about the RX1 images, I am struggling most with the form factor of the camera and lately have been going to the Xe1 that I had planned on selling. I am still blown away by the images I get with the XE1, the color, it’s so much less expensive and I love that I can adapt all my old lenses to it regardless of system. Heck, I have even attached some 25 year old Pentax lenses I shot growing up. I think even though I am enamored with the RX1 I think that the Fuji will likely win as my long term partner. Thanks for taking the time to let me know your thoughts! I’m intrigued by the XE1 – actually, pretty much all the Fujis. There’s something about the texture of the pictures that looks so good. The EM-5 doesn’t quite have it for me in that way – though ultimately it could be the best option, as I like a camera that autofocuses well. (It doesn’t have to be blazing-fast, but reliable at least.) That’s my real concern with Fuji. I was hoping the next generation might have this aspect dialled, as seems to be the case with the 100s over the 100. It’s always a waiting game, right? Waiting and overthinking!